The great state of Texas has given the music world many wonderful artists, and now some of those artists are giving back to St. Jude Children’s Research Hospital. 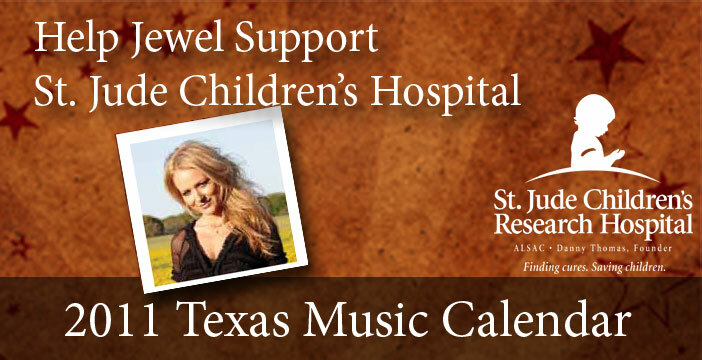 The 2011 Texas Music Calendar features artists including George Strait, Miranda Lambert, Richie McDonald, Clay Walker, LeAnn Rimes, Clint Black, Jewel, Pat Green and Radney Foster, Robert Earl Keen, Chris Cagle, Randy Rogers Band & Trent Wilmon. This is a 13 month calendar, and 100% of the net proceeds from the sales benefit St. Jude Children’s Research Hospital®, the nation’s No. 1 children’s research hospital. The calendar is part of Country Fans Care for St. Jude Kids, a fundraising program that seeks to unite the fans of country music's new and established stars. In 2002, Keith Urban called on members of his fan club to help raise funds for St. Jude. Urban fans took his message to heart, making the inaugural calendar in 2003 an immediate hit and an annual project. To date, the calendar has raised over $500,000 for the kids of St. Jude. The 2011 calendar marks the ninth edition of the calendar. On sale now for just $15! Click HERE to purchase.